There are three main types of pool structures (Shotcrete / Gunite, Fiberglass, Vinyl Liner) with preferences often based upon region, economics, climate, length of swim season and even soil conditions. A concrete pool is constructed by first building a rebar “cage,” in the desired shape. Gunite or Shotcrete, a high-tinsel concrete, is shot on at high velocity, then smoothed with trowels while still wet. Tile and coping (stones on top of the structure) are applied. Decks are poured up to the shell. 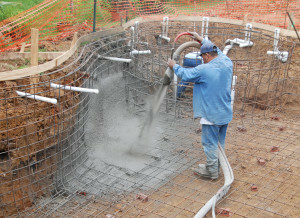 Then, the gunite is coated with either plaster or alternative such as an exposed pebble finish or other concrete blend. A fiberglass pool is a pre-formed shell that is lowered into the ground. It is then backfilled and decks are poured around it. The pool may or may not have a ceramic tile waterline. There are a finite number of shapes, colors and sizes. However, installation is about half the cost of a concrete pool and a much shorter construction time. They are also much easier and less expensive to take out if the homeowner no longer wants a pool in the backyard. Fiberglass pools are relatively lightweight. Thus, once it is set into the ground and filled with water, draining can cause it to be dislodged from hydrostatic pressure (ground water under the shell). Be aware of high water tables and take great care in draining a fiberglass shell pools. Avoid long periods of time before refilling. To build an in-ground vinyl liner pool, a hole is dug, walls made of fiberglass, metal, or concrete block are installed with a track on the top. The floor is covered with a special material to keep roots from breaking through. It is backfilled and a custom-made vinyl liner is hung from the track. After it is filled with water, holes are cut for return lines, skimmer(s), light(s), steps, etc. Vinyl liners stretch into place to pull out wrinkles. Once they are filled, they should not be drained until the liner is to be replaced – about every 8 to 10 years. Otherwise the liner can shrink and not have the elasticity to stretch back into place. Vinyl liner pools are not structures. They are also susceptible to hydrostatic pressure. Liners can “float” up off the floor, but usually settle back down after the wet season. Pets should NEVER be allowed to swim in vinyl liner pools because their claws can inadvertently cut the liner. Other sharp objects can also tear or cut the liner necessitating a repair or replacement. Fiberglass Overcoat: A process has been developed for existing swimming pools to have a fiberglass overcoat sprayed on and cured in the field. There are a few different methods, but essentially a mixture of resin and chopped fiberglass is shot on to the pool shell. It may or may not have a gel coat applied on top. It is then cured and filled with water. This material can be used on concrete pools, fiberglass shells and even to replace an in-ground vinyl liner. Plaster is a porous material and reacts with water, expelling alkaline materials, particularly in the first three years; pH will run high. Adding acid every visit to balance the high pH will affect the total alkalinity. New plaster is also more susceptible to staining than plaster that is over 5 years old. Thus, it is critical that water balance is within acceptable range the first few year of its life. Fiberglass and Vinyl Liners do not react with the water. Thus the pH of each chemical, such as chorine and conditioner, will have more of an effect on the pH of the water than in a plaster pool. It is best to not use Trichlor in these pools. Fiberglass pools should be maintained at at the higher end of the saturation index range than plaster pools to prevent a condition called cobalting, which is dark staining or streaking on the surface. If cobalting does occur, it can be treated with ascorbic (citric) acid. Further questions about pool structure? 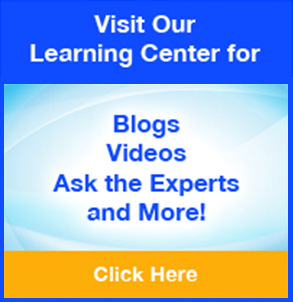 Contact us today to get your questions answered!